Jaap van Zweden arrives for the opening of the New York Philharmonic. The New York Philharmonic season has opened. It has not been an easy week. 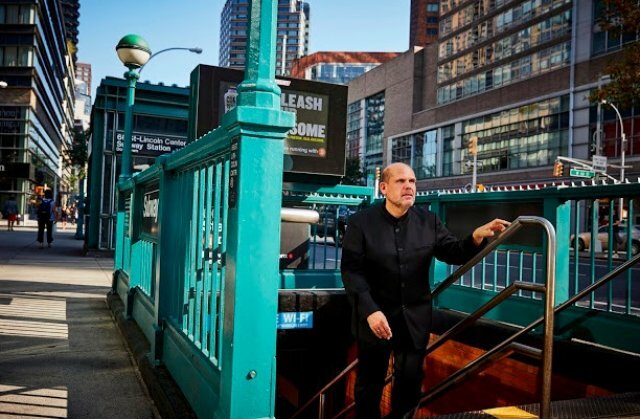 Jaap van Zweden's arrival has been overshadowed by a Sunday New York Times storydetailing the firing of two key players in the orchestra (oboist Liang Wang and trumpeter Matthew Muckey) without listed cause. However, the question marks of scandal were brushed aside for one night at least, as the orchestra offered an ambitious slate of new and modern music to a packed house. Mr. van Zweden skipped the traditional National Anthem and got right to the music on the program. The concert started with Filament by Ashley Fure, a new work. This Philharmonic commission required 18 vocalists, the singers of the group Moving Voices, positioned in the upper tiers of the Hall. Below, three spatially placed musicians (a bassoon, a trumpet and a double bass) were on little platforms: two of them were on the stage and one was house right. To this, special lighting was added: amber floods that gave a sense of warning and alarm to the music. Ms. Fure made skillful use of the technique of breathing through instruments: with trumpeter Nate Wooley and bassoonist Rebekah Heller pushing and pulling air before they ever created sound with mouthpiece or reed. The vocalists breathed and sang tones through special, mysterious looking black plastic megaphones, organic shapes that reminded one of the buccinatori in Respighi's Pines of Rome. It was an eerie and engulfing feeling, like listening to a chorus underwater, and one that turned the perceived disadvantages of poor old box-like David Geffen Hall into a distinct and canny advantage. As the piece progressed, Brandon Lopez pulled, slapped and struck his double bass. The orchestra joined the rising tide of sound, with whooshing strings, keening nail violins in the percussion section, and mutters and grumbles from the low brass. The ceremonial nature of the work was emphasized by the disappearance of the megaphone singers, and their processional entrance down the ramps of the Orchestra level. Gathering themselves into two little groups, they raised their horns and sang, creating a sort of modernist consecration of the house for this new season. Next came the most conventional bit of programming in this concert: Ravel's Piano Concerto in G with soloist Daniil Trifonov. Trifonov and van Zweden charted a merry course through these three astonishingly difficult movements, navigating the sharp corners and tight, diamond-hard passages with flair and a joyful orchestral accompaniment. Mr. Trifonov continues to grow and develop as a virtuoso soloist and to prove that point he offered an intense encore: the Ondine movement from the same composer's demanding Gaspard de la Nuit. Stravinsky's The Rite of Spring was surprisingly, the oldest work on this program. Led off by Judith LeClair's solo bassoon, the orchestra delivered a precise performance of this rhythmically complex score. All the notes were neatly in place with every bang, clatter, scoop and whoop. That was the problem with this performance. This Rite lacked a sense of wild abandon and human sacrifice that is meant to be generated by this music: it was the sound of clockwork angels at play. As the audience applauded, a few people left, most notably Peter Gelb. The Metropolitan Opera's general manager raced quickly up the ramp of the Orchestra seating. He missed a tremendous encore: van Zweden leading his new orchestra in the Ride of the Valkyries from Wagner's Ring. This performance had all of the savagery and intention that was somehow missing from the preceding Stravinsky. It was an indication that for this conductor and this orchestra (we can hope) that many good things will come. (Reprinted by permission from Superconductor).